Given the timing and conditions, not a bad turnout. 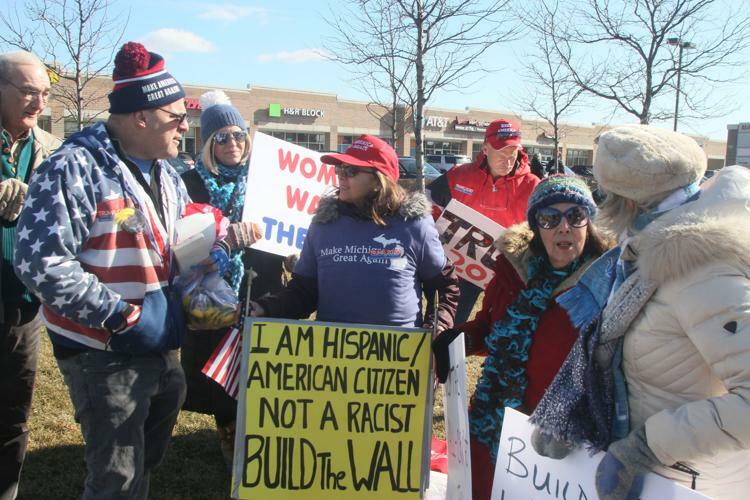 "McMurray said supporters want various Tea Party groups to get actively involved in “build the wall” rallies. The GOP was not able to quickly mobilize large numbers of supporters on relatively short notice, she said." IMHO, it's not that The GOP CANNOT mobilize supporters, The GOP DOESN'T want to mobilize supporters. Lyin' Ryan & Squish McConnell's actions have repeatedly proven that axiom. Pres. Trump's SOTU speech last week backs up my assertion. "No issue better illustrates the divide between America’s working class and America’s political class than illegal immigration. Wealthy politicians and donors push for open borders while living their lives behind walls, and gates, and guards. " Yep, lot of open border liberaltarian Koch brothers and cheap imported labor US Chamber of Commerce monies flows threw GOPe fingers in The Swamp. OABTW, not sure what being a Hispanic hyphenated American has to do with anything- build the damn wall! This whole thing of everyone being "tagged a racist" has worn finally itself out and, nobody gives a damn anymore. Hint* it died when a 16-year-old boy wearing a red MAGA hat was being harassed by chief Dances with Soros and his stupid drum. The fact of the matter is that we now have more Americans dying a year from narcotics being smuggled across our Southern border than we do from drunk driving collisions. This is completely preventable- with a border wall.